Yes, really. 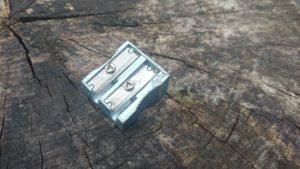 An old-fashioned metal pencil sharpener. 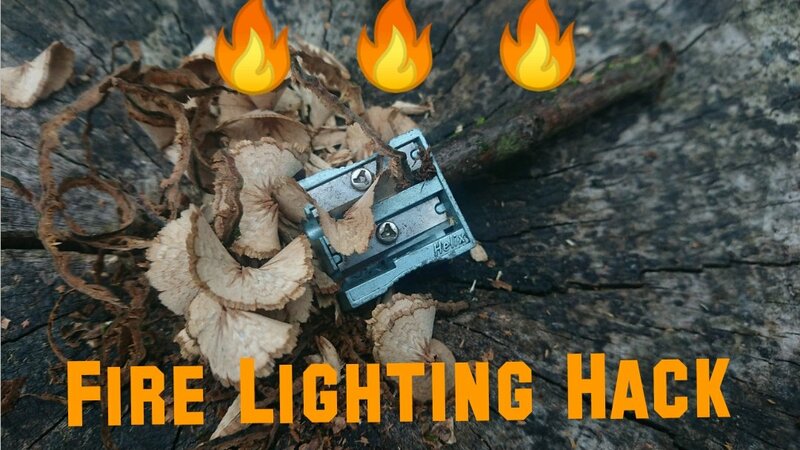 I always carry around a pencil sharpener in my fire lighting kit. 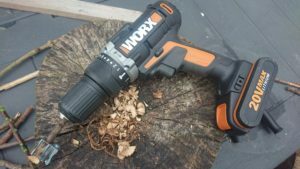 It’s such easy way to create tinder and also when it’s been raining and all the wood is soaking wet, the wood in the middle will be bone dry so we need to get to the dry wood. There’s many materials that can be used for tinder such as pine needles to dryer lint to get the fire starting job done. But if you haven’t got any of those or can’t find any in the forest. a good old fashion metal pencil sharpener can be used on an appropriately sized stick to make tinder. Once the little fire of tinder is going, slightly larger kindling can be added to keep building the fire. I always make sure I have a metal. 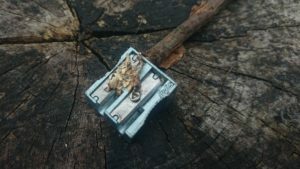 Pencil sharpener in my fire lighting kit, and so do my Scouts carry them aswell as the fire steel. 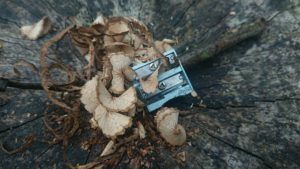 It’s a really simple process to make dry tinder using a pencil sharpener… In a nut shell you use the pencil sharpener as you would when you sharpen a blunt pencil, instead of a pencil your using a twig. You then you the shavings as your dry tinder its as easy as that . So so simple but yet very effective! There’s even a Scout Leader bigger hack…..
You whack the twig into a drill to make it easier and bigger and better curls . I made a vlog post about this simple hack if you would like to watch it in action. That’s an absolutely ingenious hack – and I love the drill addition too. Though now I’m wondering if I’m missing out by not taking a drill with me when we camp? !